KANSAS CITY, Kan., August 22, 2017 /3BL Media/ — General Motors’ Fairfax Assembly plant, home of the Chevrolet Malibu, earned ENERGY STAR®certification from the U.S. Environmental Protection Agency, signifying it meets strict energy performance levels. GM Fairfax is the only manufacturing plant in Kansas to earn such certification in the last nine years. Below are some energy-efficient practices the facility employs. Implementing a new paint process. The Chevrolet Malibu, which gets an EPA-estimated 36 highway miles per gallon, gets its glossy shine through a paint process that uses 40 percent less energy per vehicle compared to traditional paint shop processes, saving $4 million a year. GM Fairfax’s new paint shop uses a water-based “three-wet” paint operation that eliminates the need to use a primer bake oven between primer and color-coating layers. GM also recirculates air in paint spray booths, requiring less frequent outdoor air intake and temperature adjustments. Establishing energy teams. Employees champion simple energy-saving initiatives such as shutting down equipment and turning off lights during non-production times. They also share this knowledge and resources across all departments to help the facility meet non-production energy targets. Optimizing heating and cooling temperatures. An energy management system, Energy OnStar, enables employees to monitor heating and cooling temperatures in real time. Adjusting temperatures by even one degree can immediately realize 3-4 percent in energy savings. Illuminating with LEDs. More than 3,500 new LED lights in the facility’s administrative and engineering mezzanine save the plant $56,000 in energy costs every year. The team is strategizing to expand the use of LED lighting throughout the plant to make an even bigger impact. Continuing the momentum. 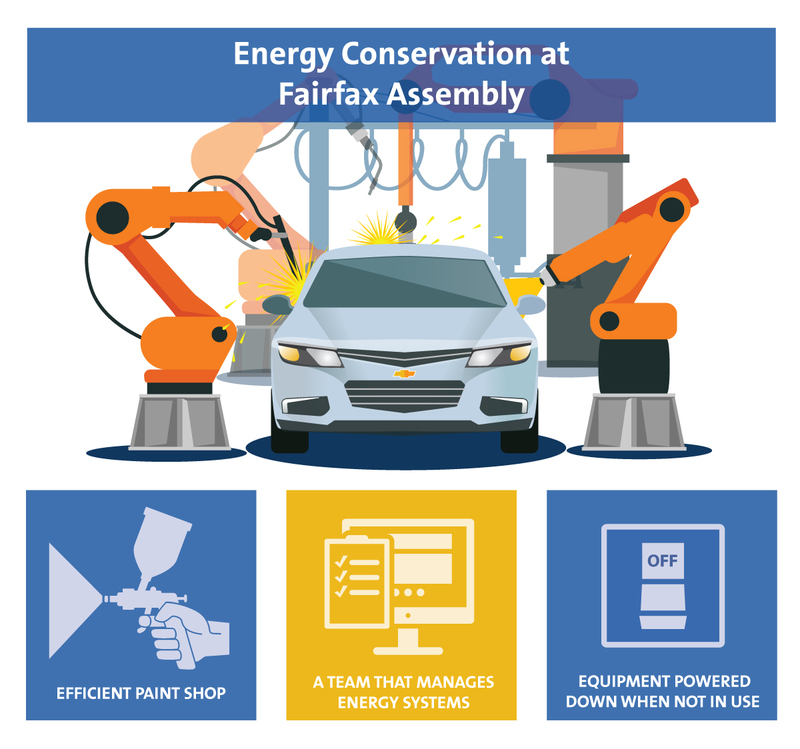 While this is GM Fairfax’s first ENERGY STAR certification, the facility met the ENERGY STAR Challenge for Industry in 2010 by reducing energy intensity by 16 percent in just three years. GM Fairfax also recycles or reuses 89 percent of waste from daily operations. This year, the Kansas Department of Health and Environment presented GM Fairfax with the Pollution Prevention award for efforts to reduce energy use, emissions and waste. GM is committed to reducing energy use per vehicle produced by 20 percent by 2020. Between 2010 and 2016, the company has reduced energy by 16 percent. This year, GM earned ENERGY STAR’s Partner of the Year – Sustained Excellence award for continued corporate-wide leadership in protecting the environment through superior energy efficiency. For more information on GM’s environmental commitments, visit its sustainability report or environmental blog. General Motors Co. (NYSE: GM, TSX: GMM), its subsidiaries and joint venture entities produce and sell vehicles under the Chevrolet, Cadillac, Baojun, Buick, GMC, Holden, Jiefang and Wuling brands. GM has leadership positions in several of the world's most significant automotive markets and is committed to lead the future of personal mobility.